1. In DPRK, a total of just under 5.5 million tonnes of staple food production from cooperative farms, individual plots on sloping land and household gardens for 2011/12 is expected, including estimates for the 2011 main season harvest and forecast for the 2012 early season crops. This is about 8.5 percent higher than the revised near normal production in 2010/11 reflecting higher plantings and yields. When paddy is converted to milled rice and soybeans to cereal equivalent, the above total production comes to 4.66 million tonnes. 2. The increase in production was mainly due to the increased availability of fertiliser (up about 50 percent compared to last year), diesel and electricity in spite of the adverse weather. The July-August floods affected paddy crop and the subsequent typhoons particularly impacted the maize crop mainly in North and South Hwanghae, two of the important grain producing provinces. 3. Soybean production this year increased to 254 000 tonnes (294 000 tonnes in cereal equivalent) or about 60 percent higher than the low level of last year. However, given the overall inadequacy of pulses, efforts should continue to increase the protein content of the diet. 4. This year’s poor harvest of early crops has resulted in the shortage of wheat, barley and potato seed for the 2012 winter and spring crops. 5. Based on the Mission’s estimate of total utilization needs of 5.40 million tonnes of cereal equivalent (rice in milled terms), the Mission estimates cereal import requirement of 739 000 tonnes for the 2011/12 marketing year (November/October), which is 347 000 tonnes lower than the 2010/11 estimate of 1.086 million tonnes by the Rapid Food Security Assessment (RFSA). According to the Ministry of Food Administration and Procurement, 325 000 tonnes of commercial imports are planned for the upcoming marketing year. Given this, the Mission estimates an uncovered food deficit of 414 000 tonnes for the 2011/12 marketing year. 6. From May through September 2011, much of the population of DPRK suffered prolonged food deprivation as the Public Distribution System (PDS) ration of cereals was reduced to 200 grams or less per person per day, providing only one-third the minimum daily energy requirement. The combination of commercial imports, bilateral assistance, and early crop harvest was not sufficient to cover the cereal requirement. In response, urban PDS dependent households sourced a large proportion of their food supply from relatives living in rural areas, by collecting wild foods, and/or by accessing informal market mechanisms. 7. Health officials interviewed reported a 50 to 100 percent increase in the admissions of malnourished children into paediatric wards compared to last year, a sharp rise in low-birth weight, and the mission team observed several cases of oedema. Inadequate food intake has clearly compounded the health and nutrition status of vulnerable groups. 8. The mission recommends provision of 120 000 tonnes, in cereal equivalent, of fortified blended food, fortified biscuits, and other high protein food commodities for distribution to 3 million vulnerable people, living in the five most food-insecure provinces of Ryanggang, Chagang, North Hamgyong, South Hamgyong, and Kangwon and in the food deficit counties of four other provinces of North Pyongan, South Pyongan, North Hwanghae, and South Hwanghae. Comprehensive monitoring and reporting remains critical to ensure the effectiveness and efficiency of support provided. 9. The planned commercial imports and recommended food assistance do not fill the entire uncovered food deficit leaving an additional gap of 294 000 tonnes of cereals (i.e. 414 000 tonnes of uncovered national deficit minus 120 000 tonnes of recommended food aid). The Mission highlights the importance of meeting this gap to ensure adequate food is available through additional imports by the Government supported by the international agencies and bilateral donors. 10. The Mission is concerned that another year of prolonged food deprivation will have a serious impact on the health and nutrition situation of the population and recommends a package of food-based nutrition interventions to address the deficit of protein and fats in the diet of young children, pregnant/lactating women, and the elderly. 11. In order to improve food security in the short to medium term, the Mission also makes recommendations for national and international support for - (i) inputs, in particular plastic sheets and seeds for the early crops wheat, barley and potatoes, (ii) support for conservation agriculture (CA) and (iii) general assistance to private household garden production. An FAO/WFP Crop and Food Security Assessment Mission (CFSAM) visited DPRK at the request of the Government from 3 to 17 October to assess the 2011 main-crop harvest, forecast the 2012 production of winter and spring crops, estimate cereal import requirements for the 2011/12 marketing year (November/October), to assess the household food security situation and estimate food assistance needs. The mission was divided into four (4) teams to allow adequate time in each province, given the large geographic area visited during the 10 days in the field. Mission members represented a wide variety of skills and perspectives on agriculture and food security. Korean speaking international staff from WFP accompanied the teams in the field. Experts from the donors joined the mission as observers. The Mission visited 29 counties and cities in all nine agricultural provinces, representing a wide range in terms of their contribution to food production (low, medium and high), importance to shocks experienced, and prevalence rates of undernutrition. Provinces and Counties visited, include: Ryanggang (Paekam and Pochon counties; Hyesan City); North Hamgyong (Yonsa and Puryong counties; Kimchaek City); South Hamgyong (Pukchong, Yonggwang, and Hamju counties; Hamhung City); Kangwon (Pobdong, Chonnae, and Anbyon counties); Chagang (Tongsin county; Huichon City); North Pyongan (Gujang and Unjon counties; Sinuiju City); South Pyongan (Bukchang and Mundok counties; Tokchon City); North Hwanghae (Yonsan, Koksan, Singye, and Rinsan counties); and South Hwanghae (Samchon, Chongdan, Yonsan, and Paechon counties). The Mission did not conduct field visits in the remaining two urban provinces of Pyongyang City and Nampho City. The Government provided the Mission with official crop area and production figures and other relevant information, including: records of cereal imports and bilateral food assistance; demographic data for each county; PDS ration levels and food transfers; and meteorological data. The Mission reviewed and, where necessary, adjusted the estimates in light of interviews with Government and cooperative-farm officials, observation of standing and harvested crops, and evaluation of the remote sensing imagery on rainfall and vegetation. The Mission met with Government officials at national, provincial and county levels, and visited cooperative farms, and rural and urban households in all the selected provinces. The Mission also visited and interviewed the staff of nurseries, hospital paediatric wards, Public Distribution Centres (PDCs) and some county grain storage facilities. Discussions were held with staff of UN agencies, NGOs (locally known as EU Project Support Units, resident diplomatic missions, and Swiss Development Cooperation (SDC). This was the first CFSAM where members were permitted to visit daily markets in addition to farmers’ markets, and state shops. Although, the mission was able to directly observe PDS distribution in only one Centre, its members did visit Public Distribution Centres (PDC) and county warehouses. Stocks observed in county warehouses were at very low levels. County officials described the stocks as originating from bilateral donations, commercial imports, and recent maize and potato harvests. Events of this year were more or less a repetition of last year, but more exaggerated and extreme. Once again, with overall improved delivery of farm inputs the Ministry of Agriculture anticipated a significant increase in crop production compared to 2010. And once again these potential increases were partly cancelled out by an unremitting series of extreme weather events. A very cold and prolonged winter with a 40 day period below zero in the south and little protective snow cover was followed by a spring drought. A 60 day rainy period from mid-June meant that crops, already late, grew only slowly because of lack of sunlight. Rainfall in July was intense with South Hwanghae receiving more than twice the long term average leading to severe flooding of paddy and water logging of maize. This was followed by typhoons that reduced pollination in maize, and also knocked down some of the crop, but the effects were not so bad in the middle latitudes of the country compared to the south. A dry harvest period has been welcome, but overall yields are more or less the same as the near normal last year for paddy, and a modest increase for maize. The mix of inputs also limited yield potential. Although N fertiliser was up on last year by 55 percent, P and K were down to half and one third respectively. This fertiliser imbalance, a common characteristic of earlier years, is an underlying cause of generally low average yields. One farm manager interviewed who had access to balanced fertiliser inputs had paddy yields consistently double the national average. Severe shortage of plastic for seedbeds, insecticide and herbicide also had significant negative effects on average yields, the value of loss far exceeding the value of these inputs. But the increased application of lime, the steady increase in Conservation Agriculture (CA), and reliable irrigation, all indicate good progress on sound foundations. It would be misleading to be too positive about the increased numbers of operational tractors and improved access to diesel. Both are indeed improvements but from a very low and insufficient base, and mechanisation strategy is still rooted in the 1960s. The numbers of draught oxen, and mass mobilisation of urban labour, are still increasing. The absence of a clear mechanisation strategy does nothing to satisfy the pressure from farm managers who want to increase the area under CA, rightly seen by the MoA as the agronomic bedrock of recovery. Now, with winter wheat planted, and barley and early potato areas being planned for the spring, the achievement of target areas will depend on seed imports by MoA given the severe shortage of seed. Meanwhile, potato stores are being deepened to safeguard against frost which penetrated up to 1.2 m into the ground last winter, even in the south, and killed stored potato seed. For 2011, the Mission estimates an increase of about 2 percent in paddy production, and about 10 percent in maize production. Once again there was a big increase in soybean area, up 46 percent on 2010, and in production 59 percent up, which reflected at least two things: first, a rising general trend as CA and more balanced crop rotations are preferred; second, a more immediate necessary reaction to high winterkill of wheat and inability to compensate fully with potato. Government policy for a more nutritious diet and a healthier agricultural rotation may also have played a part. The early potato crop was very badly hit by the severe winter this year and the effects of this are still evident in the current shortage of potato seed, but plans by MoA to import potato and wheat/barley seed has meant that forecasts for the 2011/12 season show a theoretical return to normal. 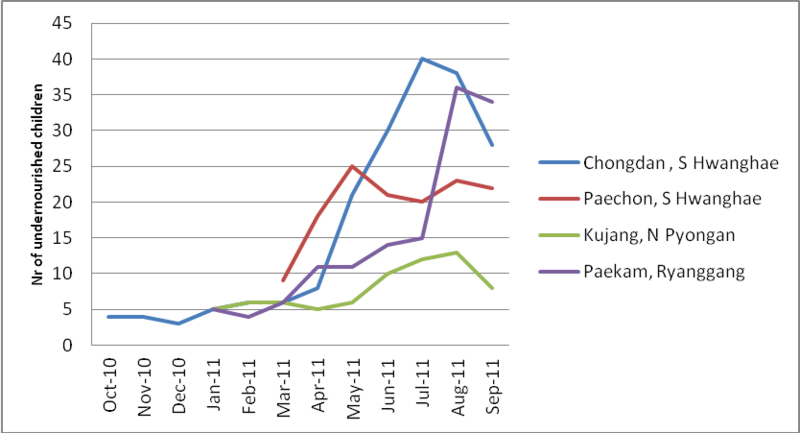 This will depend on delivery of the right potato and wheat/barley seed varieties to the right areas by mid-March 2012. Including this forecast harvest of the 2012 early season crops, a total of just under 5.5 million tonnes (8.5 percent more than last year) of staple food production comprising of paddy, other cereals, soybeans and potatoes in cereal equivalent from the cooperative farms, individual plots on sloping lands and household kitchen gardens for 2011/12 is expected. After converting paddy to milled rice and taking total utilization needs for the year, an import requirement of 739 000 tonnes of cereals is estimated for 2011/12 marketing year (Nov/Oct). Considering the planned Government imports of 325 000 tonnes, the Mission forecasts an uncovered food deficit of 414 000 tonnes. This is about half of the 2010/11 uncovered deficit estimated at 886 000 tonnes (revised by RFSA). The combination of commercial imports, bilateral assistance, and harvest of early crops were not sufficient to cover the deficit. The Government reduced the Public Distribution System (PDS) ration of cereals to 200 grams or less per person per day from May through September 2011, providing only one-third the minimum daily energy requirement. The reduction of PDS rations this past lean season drastically reduced household food security. As a result PDS dependent households sourced a larger proportion of their food supply from relatives living in rural areas or through informal market mechanisms than in normal years. They also increased consumption of wild foods, both through individual foraging and through group collection, organised by their places of work. 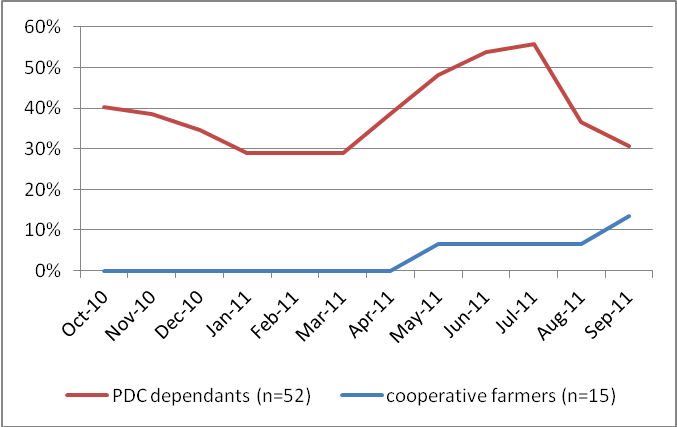 Many cooperative farm households were forced to compromise their own food security, in order to assist PDS dependent relatives. Both cooperative farmers and PDS dependent families told the mission they had reduced the numbers and size of meals to a much greater extent than in recent years. There was also significant shortage of fats and protein in the diet over the lean period, especially among PDS dependents. Health services reported a 50 to 100 percent increase in admissions of malnourished children into paediatric wards compared to last year, a sharp rise in low-birth weight, and an increased incidence of oedema, particularly in the North and North-East. Despite emergency appeals, international food assistance was not sufficient to meet the needs of the most vulnerable: children, pregnant and lactating women and the elderly. In the current marketing year, 2011/12, substantial increases in commercial imports and/or external assistance are needed to cover the deficit. Following the very difficult lean season, in mid-2011, the health and nutrition situation of the population is precarious and continued food deprivation will have a serious impact on young children, pregnant/lactating women and the elderly. This warrants urgent attention and action as DPRK officials have noted that the average PDS ration planned for 2011/12 will be 380 grams per person per day. In this context, there is a clear need for international food assistance to address the nutritional needs of these groups, with an increased focus on offsetting the deficit of fats and proteins in the diet. Economic trade of DPRK is limited to a very few countries, with China and the Republic of Korea (ROK) accounting for about 80 percent in 2010. Judging from the statistics, the country’s total trade deficit increased by nearly 50 percent in just five years, rising from a low of USD 983 million in 2003 to an estimated record high of USD 1.53 billion in 2008. Although the annual trade deficit decreased subsequently in 2009 and 2010 due to lack of hard currency to pay for imports, the accumulation of trade deficit has had a negative impact on the country’s ability to import food and other essential goods. The most important source of imports for DPRK is China, which is also the largest trading partner. Total exports to China in 2010 nearly tripled reaching USD 1.195 billion, an increase of USD 847 million from the previous year, while imports from China reached USD 2.277 billion, an increase of USD 804 million (estimates by Korea Development Institute). The trade deficit with China in 2010 was slightly lower from that in 2009, but still over one billion dollars. From January to August this year, the total trade deficit is estimated at USD 514 million (Table 2). ROK was until recently DPRK’s top export destination accounting for about half of all exports. However, strained political ties between the two countries, including a trade ban by ROK this year, has severely impacted exports and reduced foreign currency earnings of DPRK. The primary commodities exported from DPRK, particularly to China, are iron ore, coal, fish and timber. There have been reports that exports of iron ore and coal have increased substantially this year, reflecting an expansion in investment by overseas companies. The official data has shown that DPRK exports of coal and coal products from January to September 2011 were more than USD 800 million, compared to some USD 395 million in 2010. The export of coal is mainly driven by foreign currency demand as import bills increase for oil, fertilizer, food, and public investment in roads and railways. DPRK imports most of its oil and energy, hence its import bill is vulnerable to fluctuations in global oil prices. During 2010/11 (November/October) marketing year, DPRK imported about 548 000 tonnes of fertilizer and 300 000 tonnes of cereals. Source: Economist Intelligence Unit, August 2011 Country Report and earlier issues. Source: 2010 and 2011 Official Chinese Customs data, 2009 based on Korea Development Institute and EIU. DPRK has been dependent on significant quantities of food imports, in recent years ranging from a high of 938 000 tonnes in 2005/06 to a low of 293 000 tonnes in 2008/09 (see Figure 1). In general, the international assistance, bilateral as well as multilateral food aid, has significantly declined, especially from the traditional donors and commercial imports have increased. In recent years, DPRK has received limited bilateral and multi-lateral food assistance. Prior to 2008/09, DPRK received more than 400 000 tonnes of rice per year in bilateral assistance from ROK and substantial multilateral assistance through WFP. In 2008/09, overall bilateral food assistance declined to about 31 000 tonnes and from 2009/10 onwards, both bilateral and multilateral food assistance has been limited. China continues to contribute 20 000 tonnes of soybeans each year, on average, as well as critical non-food assistance, including fuel and agricultural support. Other countries including Russia, Myanmar, Viet Nam and India have provided cereals or cereal flour to DPRK, but not in quantities sufficient to compensate for the decline in bilateral and multilateral assistance. DPRK has had to rely more upon commercial imports in order to mitigate the negative impact due to reduced international and bilateral food assistance. However, given the large magnitude of the import requirements, commercial imports need to increase substantially in order to avoid undernourishment of the population. The commercial import capacity of DPRK is constrained due to high international food and fuel prices, a growing trade imbalance, and domestic economic policy changes including the re-denomination of DPRK currency (KPW). Source: National Coordination Committee, Government of DPRK; for 2010/11 additional data on commercial imports from Chinese Customs and bilateral aid of 51 700 tonnes of maize from ROK. An important market reform, instituted in 2003, has officially recognised farmers’ markets and allowed them to operate in the country. In addition to vegetables, potatoes and green maize from kitchen gardens, a variety of consumer goods are sold in these markets. Farmers’ markets convene three times each month. Cooperative farms, however, do not have direct access to these markets to sell their staple food commodities. Any surplus over and above their grain allocation for home consumption must be sold to the State Food Procurement Agency (Food Administration Department). They also have to sell their non-cereals produce to the Agency that buys it for distribution through State Shops. On 30 November 2009, the Government announced a drastic new policy of redenomination of the national currency. Under this policy the population was required to turn in the old won bills for the new ones. But, with a cap of 100 000 North Korean Won (KPW), equivalent to about USD 714, per family, anyone with excess amount would receive one new won for 100 old ones, thus basically wiping out much of the private savings and wealth2. The stated purpose of such a policy may have been to control the persistent inflation by reducing the money supply in the economy and also to curb the growth of the market economy and private enterprise profit making. Following this reform, the salaries remained the same, but prices were reduced significantly. For example, PDS prices of rice were dropped to KPW 24 per kg from KPW 44 before and maize to KPW 14 from KPW 24. The new procurement price of paddy from cooperative farms was set at KPW 29 000/tonne whereas it used to be KPW 42 000 before. The value of the “new currency” did not change significantly with respect to the foreign currencies. For example, the official exchange rate with US dollar changed only slightly, going from KPW 140 to KPW 135 per USD from 30 November to 1 December 2009. Since then the won has been re-valued and it currently stands at KPW 100 to USD 1. 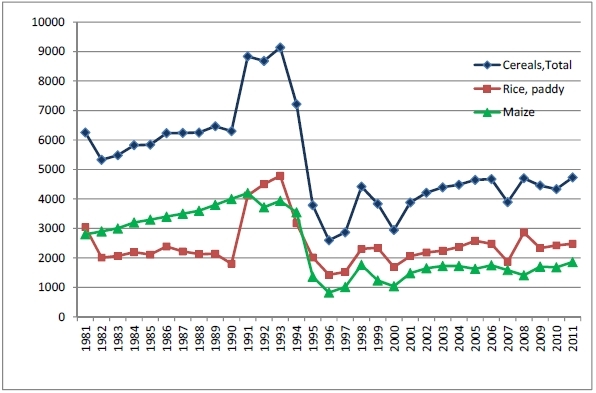 The welfare implications of this policy change on the middle and upper class were obviously negative. For the low-income households which did not have savings of more than KPW 100 000, however, the short term food security impact was positive. The purchasing power of this group was increased since the prices of the basic commodities were reduced. However, the impact on prices in the open markets reportedly has been quite the opposite. Longer term impacts of this wealth redistribution policy are not yet clear but are likely to discourage private savings, investments and market activities resulting in a net negative impact on production and economic growth. Agriculture, including forestry and fisheries, is the main contributor to the national income; however, its contribution to the GDP has declined from about 30 percent in the early 2000s to some 20 percent currently. The performance of this sector has been erratic with negative growth rates in several years in the recent past. Natural disasters such as droughts, floods, tidal surges, hailstorms, typhoons and extremely cold winters have affected agriculture with a varying degree of severity with consequent adverse impacts on food production, especially during 1996, 1997, 2000 and 2007 (see Figure 2). Years 2009 and 2010 do not seem to show much improvement either in spite of increased inputs. Even with the small improvement in 2011, the total cereal production has stagnated well below the plateau of 5 million tonnes. Major challenges remain to reach the level of agricultural production achieved in the 1980s. The precarious foreign exchange situation has not allowed adequate commercial imports of much needed agricultural inputs such as fertilizer, pesticides, plastic sheeting, spare parts for machinery, tyres for tractors and trucks, fuel, etc. Over the years, domestic production of fertilizer has declined to a level of about 10 percent of total requirement, increasing dependence on fertilizer imports and reducing its use. Much needed lime application to improve fertility of acidic soils is severely constrained by the lack of transport facilities and fuel availability. Yields of the main paddy crop used to be around 7 or 8 tonnes/ha during the 1980s, but now they are about half of that, due to a departure from sound agricultural techniques and the lack of agricultural inputs. In order to increase total food production in the country, every possible piece of cultivable land, including plots with extremely high slopes in mountainous areas, are being brought into production under a temporary derogation of official policy. Although the Ministry of Land and Environmental Protection (Mole) has devised regulation for sloping lands and re-forestation, the rehabilitation and renewal progress has been slow. Cultivation of marginal lands has unintended consequences of soil erosion, increased risk of flood damage to more productive lowland, and further reduction in overall land productivity. Thus productivity improvement is desperately needed. Double cropping of wheat and barley after rice and maize (cereal after cereal) on already exhausted soils is unsustainable and with the existing level of mechanization seems to have reached its limits. Increase of leguminous crops and potatoes in the crop rotation is vital. Emphasis on pulse crops would also help improve the protein content of the national diet. Mechanization on the farms perhaps represents the biggest challenge and biggest potential in DPRK. With the recent rehabilitation of old tractors and acquisition of some new tractors, the operational rate on farm tractors has improved to about 72 percent in 2011 up from 57 percent in 2004. The major constraint, in addition to the old technology machinery, seems to be the shortage of spare parts, tyres and fuel. But these are improvements only to a mechanization strategy that was established in the 1960s whereas fundamental new strategies and technologies are needed to meet the demands of agronomic advances in conservation agriculture, double cropping and intercropping. The agricultural marketing system is tightly controlled as all cereals and soybean output of the cooperative farms must be sold to the State. The prices offered to cooperative farms seem to be attractive; however, the net income of farmers varies depending on the surplus they can produce and the cost of all inputs (seed, fertilizer, pesticide, fuel, etc.). Access to farmers’ markets at least for the produce over and above the allocated production quota may provide good incentive to farmers to produce more on the cooperative farm as well as on their own small kitchen garden plots and help alleviate critical shortage of staple food. DPRK has a continental climate that would normally and reliably allow a single crop season. In the north of the country single cropping is almost always the case, but in the south the climate can allow double cropping though this is always a risk. The shortage of properly annual cultivable land, about 15 percent of the total, means there is pressure to take this risk. 60 percent of precipitation occurs June to September, which is generally reliable but often brings floods and typhoons. The remaining 40 percent of precipitation is not so reliable so that droughts are common in spring, winter and autumn. Additionally, snow cover can be thin or absent which is significant for crop survival in the long cold winters. Overlying all of this is climate change, of which the least controversial aspect, globally and generally speaking, is that weather events are more extreme. DPRK seems to be no exception. Thus, winters are becoming colder, summers have more intense rainfall and typhoons, and droughts are more frequent and prolonged. Unusually, this year in most regions all of these weather risks coincided to a greater or lesser degree to impact severely on potential crop yields. The winter of 2010/11 was again colder than usual with low temperatures extending into the spring. In some areas, even in the south, frost penetrated more than 1.2 metres into the soil, and in many areas there was a continuous period of sub-zero temperatures for 40 days. Autumn and spring droughts were widespread with a 40-day dry spell starting in April in the south. Winter protective snow cover was poor. Planting of potato and re-planting of winter-kill areas of wheat and barley were later than usual, and crop establishment was slow due to drought. The summer had three main weather events that negatively impacted crop yields. First, heavy cloud cover and rainfall for more or less 60 continuous days from end-June meant that crop growth was slow because of lack of sunlight. Second, intense rainstorms during this period led to floods and waterlogged soils so that much of the paddy area was inundated for more than seven days leading to death of paddy plants, and maize roots died because of lack of aeration. Third, typhoons at the end of this 60 day period coincided with the pollination period of some of the paddy and most of the maize with winds high and prolonged enough to severely reduce pollination. These three events were more severe in the south-eastern rice bowl that produces about 80 percent of the nation’s cereals than in other regions. Figure 3 below shows monthly rainfall data by province and compares 2010/11 monthly rainfall with long-term averages for four selected provinces. 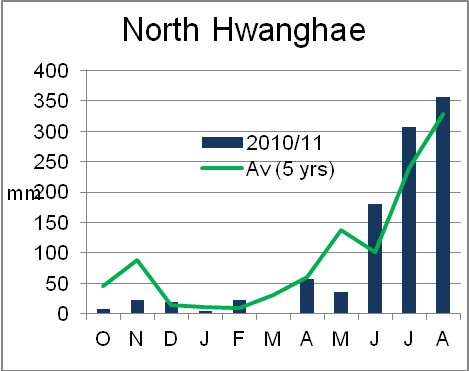 The South Hwanghae chart shows July rainfall at more than twice the 38 year average. A normal national crop calendar, prepared by FAO/GIEWS, is presented in Figure 4. Total land area in DPRK amounts to 122 543 km2, of which an estimated 17 percent, or slightly more than 2 million hectares (ha), is cultivated by cooperative farms. Of this, approximately 1.4 million ha are considered suitable for cereal cultivation, 0.3 million ha are under vegetable crops, some 160 000 ha under fruit orchards3, and the balance is industrial crops such as mulberry, cotton, tobacco and ginseng. Additionally, between 0.4 million and 0.45 million ha are farmed by other government institutions. The CFSAM looked at production on cooperative farmland only. Because of the mountainous terrain there is limited scope for expanding cultivable areas and for this reason emphasis has been placed recently on increasing production by double-cropping, but this carries some risk (see section below on double cropping). The main-season crop area under cereals, potatoes and soybeans this year amounted to 1.27 million ha, an increase of 3.6 percent on 2010 (Table 4). The possibility of a large reduction in area because of shortage of wheat/barley and potato seed is anticipated for the coming winter and spring crop (Table 5), though seed imports may allay this. In aggregate, and including kitchen-garden and sloping-land production, the 2011/12 cropped area is estimated to be more than that of 2010/11 by 3 percent. Paddy is the most important crop of DPRK in terms of both area cultivated and production (though milled rice production is second to that of maize). Paddy is grown mainly in the central, south-western and south-eastern parts of the country (the lowland parts of North and South Pyongan, North and South Hwanghae, Pyongyang, Nampo and Kaesong, collectively known as the "Cereal Bowl") and the narrow east coastal strip comprising parts of Kangwon, and North and South Hamgyong Provinces. Smaller areas are also cultivated in Chagang and Ryanggang Provinces. From about six years ago a large-scale realignment operation to improve the size and layout of paddy fields, according to the Ministry of Agriculture, increased the overall paddy production area by about 60 000 ha. In 2011, the area under paddy was reported as 571 364 ha, representing only a slight increase on 2010. Maize, which is mainly produced under rainfed conditions, is more universally distributed than paddy. This year’s maize area of 503 000 ha is the same as last year. DPRK is the only country worldwide to adopt maize transplanting on a wide scale, a result of double cropping strategy and of the relatively short warm growing season. Potatoes are grown as an early (spring) crop in the Cereal Bowl region, and as a summer main crop in the cooler northern highlands (Chagang, Ryanggang), where there is a shorter growing season. As a double crop, potato is sown in March-April and harvested in June, while as a main crop it is sown in May-June and harvested in August-September. In response to the reduced productivity of the main cereals since late 1990s, and because potato potentially produces far more carbohydrate per hectare than almost any other crop, the potato area has been gradually increasing in the major agricultural areas over the past decade. Greater emphasis has recently been placed on the early crop in view of the frequently poor yields of winter wheat. The availability of planting material is often the single most important limiting factor to the expansion of the area under potato, and since about 2002 the national potato seed industry has generally performed well, delivering virus free foundation seed to dedicated seed farms in every county, whence seed is delivered to the cooperative farms. Mainly IFAD and SDC, as well as other agencies, responded to government requests for investment and technical assistance to help deliver a hugely improved potato seed service. But it is at cooperative farm level where most of the potato seed is stored during the often severe winter months and where large losses can occur. Following the severe winter 2010/11 cooperative farms experienced large losses in storage due to freezing and they are now rebuilding their potato stores deeper. Additionally the seed farms were unable to deliver the usual needed amounts of seed due to their own frozen seed followed by a spring drought. As a result current plans for planted areas in spring 2012 will depend on whether enough seed potatoes can be imported and distributed by end March 2012. These current plans are shown in Table 4. Winter wheat is sown from end September to mid-October, immediately after the harvesting of the main-season crops. Factors influencing the area under winter wheat, and yields, include: autumn rainfall; seed availability; access to adequate farm power and labour in the autumn at a time when the demand for labour is high for other operations, especially the harvesting of paddy; winter kill in the event of a cold winter without snow cover; spring rainfall; and finally (and not least) the availability of labour and/or machinery at the short harvest window of seven to ten days in mid-June. Winter wheat and spring barley are produced in all provinces except Ryanggang and North Hamgyong. They were the main cereals in the Double-Cropping programme initiated in 1996 jointly by FAO and UNDP as part of the Government framework for agricultural recovery. However, since then, the low survival rate of winter wheat during some severe winters, especially the most recent ones of 2009/10 and 2010/11, has prompted farms to place increasing emphasis on early potatoes, though as yet without any significant reduction in the area under winter wheat. This is another example of trying to do what is agronomically difficult in any circumstances in DPRK, and especially when farms are under-resourced regarding farm mechanisation. Most farm managers interviewed during the CFSAM field visits cited this as a prime constraint. See also section on Double Cropping below. The total area under wheat and barley was 85 292 ha in 2010/11, of which 87 percent was spring sown. The planned areas for 2011/12 are slightly more than last year, but a severe shortage of seed may hamper these plans, and the final area sown may well be less unless seed imports can make up the shortfall as MoA plans. The same yields as for 2010/11 have been assumed. As also reported in the 2010 CFSAM, the area under soybeans continues its inexorable increase of recent years, growing from 63 000 ha in 2008 to more than 131 000 ha in 2011. There are two main reasons: first is the continuing pressure to increase the area under a legume break crop in conservation agriculture (see also section on CA below); second is as a late fill-in after other crops (such as potatoes or spring wheat and barley) have failed as a result of risky double cropping. A third factor is not so much a reason as a welcome spin-off in a country in which diets are often protein- and fat-deficient. Other crops produced in DPRK include sorghum, millet, buckwheat, mulberry, vegetables (mainly cabbage, spinach, radish, cucumber, eggplant and tomato) and fruit (mainly pears, peaches, apricots, apples and persimmons). Other cereals totalling 28 546 ha, or 2 percent of cropped area, include sorghum, millet, and buckwheat. Each cooperative farm household is entitled to a private kitchen garden of up to 30 pyong, which equates to about 100 m2. A recent informal survey indicates that the size of a kitchen garden can vary considerably from household to household but that the average size is close to the maximum stipulated 30 pyong. There are about 1.7 million farm households in the country, which translates to about 17 000 ha of household gardens. In addition, a significant proportion of urban dwellers also have access to smaller garden plots. In the absence of more reliable quantitative data, it is therefore assumed that the country’s total household garden area may be about 25 000 ha. Though limited in size, these gardens are highly productive. Farm gardens are further intensified by livestock such as rabbits, pigs, goats and poultry, formally supplied as young stock from the cooperative farm, which contribute significantly to household nutrition and income. Most farm managers, interviewed as part of this CFSAM, said they could satisfy only a small part of young stock demand. MoA’s policy emphasis on grass-fed animals fits well for farm household gardens, and fodder is gathered from outside the gardens thus increasing their fertility, crop yields and cash income. Thus, although strictly limited in size, there is scope for improving the quality of family nutrition, and cash income, through further intensification. A typical pattern of cultivation in these gardens is an early crop of potatoes and green maize, followed by vegetables such as cabbage, peppers, radish, beans and garlic, all mainly for home consumption. Together these livestock and vegetables make up a much more nutritious diet for farm households compared to their urban counterparts. Assuming yields of 6 t/ha for maize and potato on half the country’s kitchen garden area would result in an extra 75 000 tonnes of cereal equivalent. Furthermore, it can be assumed (and this was confirmed by interviews) that some of this is transferred to urban relatives, since farm workers are generally on full rations even when urban workers are on reduced PDS rations, plus they have their garden produce also. Following the mid- and late-1990s famine, the inability of the PDS to deliver full rations, and the closure of many factories, certain groups, mainly urban women and the elderly, were informally allowed to cultivate sloping land in excess of 150 that had previously been restricted for cultivation. The measure was intended to be temporary, but is practically impossible to reverse, and difficult to make sustainable. It is now seen as damaging, at least in its present form. The environmental degradation caused by slope cultivation, in particular increased risk of flooding, has been constructively recognised by the managing authority in charge of sloping land over 150, the Ministry of Land and Environmental Protection (MoLEP). Specifically, MoLEP has implemented the following actions: a) made a register of users, often as groups called Sloping Land User Groups (SLUGs); b) confirmed temporary user rights for land that it judges to be in no immediate danger; c) on many of these introduced a kind of agro-forestry in which cultivation continues while replanted trees grow and where the cultivators know that they have to move on when the tree canopy becomes too dense for cultivation; d) more permanent agro-forestry systems are being trialled; e) most recently has started to close hillsides that it judges to be unstable; f) has facilitated reforestation plans for vulnerable catchments; and g) continues to prepare a comprehensive overall plan for the future, reportedly due for release in late 2011. MoLEP’s ultimate goal, complete reforestation of all its land, apparently remains unchanged, but pragmatically it recognises that livelihoods are at risk and so it allows time to achieve this. The CFSAM did not have time to meet MoLEP staff, but these activities were reported in some of the county meetings. As reported in the last CFSAM, it is difficult to estimate crop production from sloping land. Its highly visible nature tends to exaggerate its extent; and a slope presents a wider angle of view to an observer on the ground than does a similar area of flat land. However, in 2008, MoLEP, using reports from its Forest Rangers, estimated that the deforested area was between 300 000 and 350 000 ha of sloping land. With respect to productivity, many factors conspire to suggest very low yield expectations. Most sloping-land soils may be assumed to be shallow, of low fertility and subject to accelerated erosion; because of low yield expectations, seed may be of poor quality; and since plots are usually distant from dwellings and most cultivators are not from agricultural backgrounds, crop husbandry may be expected to be relatively poor. The overall yield figure of 0.5 t/ha proposed by the 2008 and 2010 CFSAMs seems to be a reasonable estimate. Combined with an area of 300 000 ha this gives a total production of 150 000 tonnes of cereal equivalent from sloping land. It is possible that this figure is an underestimate, but in the absence of any firm evidence to the contrary, and in the expectation of MoLEP’s comprehensive plan for future sustainability of sloping lands reportedly due at the end of 2011, this figure is maintained. Improved seeds of paddy, hybrid maize, potato, wheat, barley and some other crops are produced by specialized cooperative or state seed farms, and provided on credit each year to cooperative farms through the Government’s distribution system. This year the CFSAM noted that little seed was retained on the cooperative farms, in particular potato seed, and wheat and barley seed, and of course maize seed which being hybrid is renewed annually. Most farm managers said they had been instructed to release all stocks to the PDS, and anyway they had come to depend on what are normally reliable seed farms. Potato seed is best renewed annually, and virus free seed has generally been well supplied. Paddy, wheat and barley, being cross pollinated, need to be only partially renewed each year, and most seed is normally retained. But all farm managers reported that they would be substantially short of potato, wheat and barley seed this year. Paddy is typically sown in nurseries under plastic sheets at the beginning of April and transplanted in late May or early June. Seedbed preparation and transplanting were both delayed this year, due partly to the prolonged winter, but mainly to the shortage of plastic sheets which were sufficient for only 50-60 percent of needs. Hybrid maize is also sown in seedbeds under plastic sheets, usually in individual fibre pots filled with compost for later transplanting. As already mentioned, DPRK is the only country in the world to transplant maize on a wide scale. Once again this is an example of government’s struggle to achieve double cropping, agronomically difficult in any circumstance in DPRK, but made especially difficult for managers who were seriously short of plastic sheet again this year. Potato planting material in DPRK starts as high quality virus free mini-tubers in the national potato seed centre in Ryanggang, a state-of-the-art facility that has been supported by IFAD and SDC. The mini-tubers then go each year to specialised seed farms in every county where they are multiplied to produce high grade seed for cooperative farms. From this point in the potato seed chain quality and quantity can start to deteriorate rapidly. First, following a difficult year such as 2011 with a harsh winter followed by a dry spring, quantities are insufficient for cooperative farm needs. Second, potato stores on the seed farms and cooperative farms were not deep enough to prevent freezing, and are now being deepened. Third, potato store design and treatment of seed potatoes are not good enough to prevent rotting4. Fourth, the practice of dividing tubers into several pieces for seed, as was done again this spring, and as reported by farm managers, will also have to be done in spring 2012, not only depresses yield but also, without fungicide/bactericide dipping, encourages disease infestation. These shortcomings, as well as inadequate crop rotation and often premature harvesting, are reflected in the low yields obtained. Most farm managers interviewed said they had seed for only about half the area planned for planting in spring 2012, and the figures they reported did not take account of possible losses due to freezing and rotting during the coming winter. Unless seed potatoes are imported, the area of early potatoes in 2012 will be well below plan. They reported more or less the same for winter wheat, already planted, and for spring barley. Indeed, several farm managers cited the shortage of potato and wheat/barley seed as their number one problem. As Table 3 below shows, the application of nitrogen (N) fertiliser was up by a massive 55 percent in 2011 compared to 2010 which itself had shown a modest increase on 2009. Figures don’t show the split between commercial imports and assistance, but reportedly both were up, and domestic production of urea also showed a continued steady increase since 2009. All four CFSAM sub-teams reported that this increase was well distributed round the country though there were also some reports of late delivery. The application of N fertiliser normally bodes well for potential yield increases providing they are balanced with phosphate (P) and potassium (K) fertilisers, as well as lime (to adjust pH to make N, P and K fully effective for plant growth). The 2004 CFSAM pointed out the wastefulness of imbalanced fertiliser as well as of the application of N fertiliser on low pH soils. The situation this year is not nearly as bad as 2004 in terms of this imbalance (see Lime below); nevertheless, both P and K fertiliser (from domestic production only) were well down in 2011 compared to 2010. Foreign exchange resources are understandably tight, yet the CFSAM sees no logic in spending some forex on N but none on P and K, thus resulting in imbalanced N, P and K application so that the effect of N is degraded. In mitigation, the CFSAM did notice substantial increased effort by farm managers to find, excavate, transport and spread “phosphate soil” (using their increased fuel allocation). This is a natural product but a bulky one that can be justified only over relatively short transport distances, and contains 1 percent to 2 percent phosphate (compared to the acidulated and more concentrated commercial superphosphate with perhaps 20 percent phosphate). In one significant interview with a farm manager who had received not only commercial phosphate fertiliser but was also applying “phosphate soil” (these two facts together set her apart from all other farm manager interviews), as well as lime and K fertiliser, she reported that she had achieved yields of more than 8 t/ha of paddy consistently for the previous 15 years (about twice the national average). This is illustrative of the potential huge effect of balanced fertiliser on yields and food security in DPRK. Crop yields in DPRK are frequently limited by soil acidity with several farms reporting soil pH values of between 4.5 and 5.5. The availability of lime is not usually a constraint (geologically a large proportion of DPRK is limestone) but the means of transporting it to the farms often is. Most farm managers have been limited to applying about half a tonne of lime per hectare every three years, which they acknowledge is insufficient. This year, however, as also reported in 2010, with further improved availability of diesel and operable tractors, farms have been able to apply more lime to their land; compared to the CFSAM 2004 report, the overall situation regarding lime is now much improved. All farm managers reported that supplies of crop protection chemicals were well below requirements, though some reported small increases over previous years. The shortage seemed to apply equally to insecticides as to herbicides and fungicides. Managers regularly reported serious outbreaks of cutworms, and stem borers of paddy and maize, and they also were compelled to use extraordinary measures to control these outbreaks such as crushing potato leaves and using the extracted solanin as an insecticide of only moderate effectiveness, a measure that requires huge amounts of labour to an extent that is generally counterproductive. The usual application of deltamethrin would have been more effective and would have released valuable labour for more productive activities. They also reported that the shortage of herbicides impacted negatively on their CA targets and again diverted labour from more productive activities; once again, this was a false economy in the CFSAM’s view, and contributed to the overall imbalance of farm inputs. Potato yields, based on the planted area, were significantly reduced due to shortage of fungicide. The shortage of functioning tractors reported in earlier CFSAMs seems to have eased again this year because of increased availability of diesel to 68 000 t. All farm managers reported a small increase from about 50 or 60 percent of requirement to about 70 percent. At the same time, they also reported that this deficiency continues to have a severe impact on farm operations, particularly on double cropping, intercropping, and CA. But the extra fuel also helped to deliver more lime, more compost, and where available, more “phosphate soil”. The proportion of tractors that are operational has remained the same as last year at 73 percent (nearly 46 000 of a slightly lower total of 62 800). All farm managers also reported a continuation of the steady increase over recent years in the number of draught oxen, an indication of how keenly the shortage of farm power is felt at farm level. The CFSAM’s impression from farm interviews is that the need for farm mechanisation is becoming more focused and more detailed. Whereas in earlier CFSAMs the general need was expressed for more fuel and more spare parts for the dated Chollima tractor, now farm managers (backed up by their County Farm Management Committee [CFMC] chairmen) commonly express the specific need for walk-behind single axle tractors with a narrow working width that can cope with e.g. double cropping 80 cm rows, or can work on slopes, and can be allocated to a single work team; or higher hp conventional tractors to plough hard paddy land as part of a CA rotation. This focus on improved farm power specifically for CA and double cropping is to be welcomed, but this is only at farm and county level, and there needs to be response from MoA. It may be seen as unconstructive to say that there seems to be no national mechanisation policy or strategy at a time when anything other than a continuation of what was put in place in the 1960s cannot be afforded. Yet at a time when potential technological advances in CA and double cropping seem poised to expand but cannot because farm power is hugely deficient, not only in overall amount but also in type, there are too many seemingly uncoordinated and opportunistic imports of items of experimental farm machinery. Some of this may be appropriate to farm managers’ needs, but major structural problems associated with maintaining tractors and machinery (of any type) in working order persist, including a chronic shortage of spare parts, tyres and fuel. A formal mechanisation policy and strategy is urgently needed, firmly based on CA, incorporating the views of farm managers and CCFMCs, and involving FAO’s earlier recommendations for local assembly of CA implements. The proportion of gravity-fed irrigation systems has increased significantly in the last decade with the construction of major new canal realignments. These are not only much more efficient, but at the same time release electricity to power the decreasing number of canals that still depend on electrically powered pumping stations. All farm managers interviewed reported that there were no problems with irrigation this year. For the third year running reservoir levels were above target, and in 2011 they were at a three year high at nearly 10 percent above target. Government deserves credit for this extraordinary turn-around compared to the late 1990s. Area, yield and production figures for 2010/11 are presented in Table 4 below. They are based on MoA figures, the Mission observations and discussions during the field visits. Before harvest, yield estimates are made by cutting a small sample area in each field with three observers: the cooperative farm manager, a county PDS representative, and a CFMC representative. Each need to check the results are correct from their different viewpoints. The mission felt that for the 2011 main season yield estimates to take account of the following factors that affected yield this year: poor pollination affecting several crops, particularly maize, due to typhoons and lack of sunshine; wash out or burial due to flooding (actually quite small considering the intensity and length of some of the rainstorms); death of paddy and regrowth from the roots following flooding leading to delayed or no maturity; death of maize due to waterlogging. This year’s national paddy yield, at about 4.34 t/ha, showed an increase of nearly 2 percent over last year’s 4.26 t/ha. This seemingly continues a gently rising trend, but the figures conceal a significant increase in inputs, especially N fertiliser, plus a more or less stable situation regarding irrigation, electricity, and farm power, all of which should have been reflected in a much higher yield increase. But this didn’t happen because of the extraordinary combination of severe weather events: a cold dry spring, prolonged and intense summer rainfall well above average, especially in the prime paddy area of South Hwanghae, with little sunshine, followed by several typhoons. In short, bad weather cancelled out the potential benefits of this increased effort and investment. But not all inputs were an improvement on 2010: fuel was still well below requirements; availability of crop protection chemicals did not improve; fertiliser, though up overall, was hugely imbalanced. However, this year’s production of 2.48 million tonnes of paddy shows an increase of 2 percent over that reported for last year. Reported there has been some investment in improved milling capacity. This is likely to result in some improvement in milling ratio in future. 1/ Potatoes in cereal equivalent at 25 percent conversion rate. Area Yield Prodn. Area Yield Prodn. Area Yield Prodn. 1/ Includes a small amount of main crop wheat and barley grown mainly in N. and S. Hamgyong, and Ryanggang. The weather story for maize is much the same: waterlogging, lack of sunshine, and poor pollination due to typhoons. However, average yields this year of 4.71 t/ha showed a >10 percent increase on last year’s 3.35 t/ha although the increase would have been much greater if the weather had been normal and inputs more balanced. As a result of the higher yields, national maize production this year, at 1.86 million tonnes, is up nearly 11 percent on last year’s 1.68 million tonnes. The 2011 national production of main-crop potatoes in cereal equivalent is estimated to be 121 500 t, down by over 29 percent from 158 000 t in 2010. The important early crop of 2012 is uncertain due to a severe shortage of seed. According to a number of interviews with farm managers, no more than 60 percent of requirements, not taking into account probable losses in storage during the coming winter. This estimate was confirmed by CFMC chairmen of those counties visited, and was acknowledged in general terms at the CFSAM wrap-up meeting in Pyongyang. However, MoA staff indicated that the government will import potato seed to make up for the deficit. Winter wheat planting, for which figures are not yet available, is also well down on 2010 according to interviews with farm managers, many of whom reported 60 percent of target area planted. As with potato, this could be made up with imported seed of spring barley. Assuming seed imports materialize, the forecast figures for 2011/12 show a slight increase. The level of PHLs in DPRK has long been an issue, partly because of lack of precise definition, but has been increasingly scrutinised by farm managers, CFMCs and the MoA, all of whom gave well considered, consistent and precise answers to the CFSAM’s questions. These answers mostly referred to weight, not to quality which is more subjective but at least equally important. Weight also includes moisture, and throughout the post-harvest process farm managers and the PDS hope to lose quite a lot of it, from about 20 percent when it comes in from the field, to about 12 percent when it can be safely stored, but although recorded as a loss in weight, it is not a real loss. There are many stages at which significant (real) loss can occur. In the case of paddy, if the harvest is delayed there may be some shattering in the field. Immediately after harvest, crops are left to dry in the field; if the paddy field has not been sufficiently drained or if there is substantial rainfall following the harvest (though it was exceptionally dry this year), the crop may be left lying in damp conditions which are conducive to rotting and further grain loss. Delayed collection of the crop from the field leaves it susceptible to rodent, bird and insect damage. Losses may occur while the crop is being transported from the field to the thresher. Measured losses during threshing (due to old or inefficiently set threshers, or delays in threshing as a result of power shortages) are now much lower than was supposed a few years ago. Finally, after threshing and bagging, losses may occur in storage. It is clear that much care is taken of the crop at all stages and that losses are minimized. For instance, work teams glean for dropped grain in the field after the crop has been removed (and this goes back into the cooperative farm grain stores), the harvest is placed carefully on trailers for transport to the threshers, and sheaves may be put through the thresher more than once to ensure that all the grain has been removed. Nevertheless, there are several uncontrollable variables such as rainfall and power supply, and without the implementation of effective control measures, as appears mostly to be the case, rodents may cause substantial losses in stored grain. Most farm managers were asked about PHLs, and a typical response, to which the CFMC chairman normally also contributed, was as follows: in a normal year they are 11-12 percent total up to the point when it is delivered to the PDS, of which rats/birds in the field after cutting 2-3 percent, transport to the threshing area 3 percent, threshing 4 percent, moisture 5-6 percent (but this should be excluded from the calculation), and losses in storage 2 percent for normal 5 months storage. The CFSAM could therefore consider dropping its estimate of 15 percent of previous years by one or two percentage points. But these estimates refer only to grains, and losses of potatoes are probably much higher. Furthermore, they do not consider quality. So the Mission is inclined to continue to use the overall figure of 15 percent (a regional norm) as in previous years. But it does acknowledge that, perhaps in response to its earlier requests, losses are being well analysed now, and where losses do occur remedial measures are being taken. Double cropping is difficult to achieve successfully if the weather does not cooperate or if farm inputs are insufficient. Both of these coincided this year. There is an argument, not fully supported by the CFSAM but one that should not be ignored either, that if all available resources were concentrated on single cropping, then overall returns would be higher and risk of crop failure or low yields would be lower. When double cropping does go right, then the returns are impressive, but to ensure that the risk of failure or low yields is minimised, farms need to be well resourced. Currently, farms are being coerced into double cropping while being resourced only for single cropping. Plastic sheets, for example, are a critically important resource for double cropping; even in a cold spring, like this year, they can bring paddy or maize seedbeds on by two to three weeks, a period of time that is critical, yet those seedlings do not occupy ground where the preceding crop is maturing or being harvested. But all farm managers interviewed said they had only half or 60 percent of the plastic they needed. Adequate tractor mechanisation and mechanised harvesting are also the only ways of dealing properly with the very tight window between spring crops and main crops in June. Oxen and humans on their own are not fast enough. The Chollima tractor barely has the power to cope. Added to all this, to have to divert labour at this time to making home-made insecticide out of potato leaves because chemical insecticide was not adequately provided is, as one farm manager reported, exasperating. The conclusion is that double cropping needs to be well resourced to work well, and to under-resource it runs the risk of significantly reduced yields, as was the case this year. CA is rightly becoming the flagship of the recovery of agriculture in DPRK. Not only is it now firm policy of the MoA, but it is enthusiastically endorsed by farm managers who see it (specifically non-ploughing, intercropping, freshwater snails, multi-layer system of cropping, green manure, and a four year rotation) as a way of reducing risk of the effects of extreme weather events as well as increasing yields (by about 10 percent overall). Most farm managers interviewed had introduced CA several years ago but had immediately come up against the constraints of inadequate inputs, particularly of mechanisation and herbicide. Now most have only 15 percent or 20 percent of their farms in CA, most of that on the upland, with a little on paddy land. They are equally enthusiastic about CA on paddy land, but pragmatically they see the upland as the easier option first. They say that the Chollima tractor is too unwieldy on upland, and also too wide for the 80 cms intercropping/double cropping system. They think that single axle walk-behind tractors could quickly and relatively cost effectively lead to 100 percent CA on upland. In all counties visited, all farms were in CA to some extent. As with double cropping above, the conclusion is the same, that it needs to be well resourced in order to work well. Double cropping and CA have been discussed under separate headings here, but on the farm the reality is that they are mixed. The 2011/12 national production including forecast of the next early season crops, in comparison with 2010/11 is presented in Table 5. Overall cattle numbers have remained fairly static over the last decade, but most farms reported that numbers of draught oxen have increased by 5 percent to 10 percent over the last five years. However, numbers of goats, rabbits, ducks and geese have grown significantly since 2000 (see Table 6), and goat and geese numbers continue to increase. Rabbits represent a significant source of food. Pig numbers have been deliberately reduced since 2004 because of their high demand on limited grain supplies. However, the population appears to have started growing again in the last three years. According to the Government Population Census the total national population on 1 October 2008 was 24 052 231. The Department of Statistics uses an annual rate of growth of 0.6 percent. Using this information, for the purpose of this report, the Mission estimates the mid-marketing year population for November 2011 to October 2012 as 24.57 million. Similar to CFSAM 2010, the annual per capita consumption of 174 kg of basic food commodities covering cereals (150 kg including milled rice), potatoes (16 kg of cereal equivalent) and soybeans (8 kg) is assumed. However, due to the reduced harvest of potatoes this year, its consumption has been reduced by 3 kilos and that of maize increased by the same amount. Although the total remains the same this year, the individual items are adjusted somewhat to match with the estimated availability during this marketing year. Since 2010 CFSAM, given the increased emphasis on the protein rich commodities in the diet, soybean has been added explicitly in the balance sheet. The estimated per capita food requirement of 174 kg is slightly higher than the apparent national consumption average of the previous five years, but is also considerably below the Government’s target weighted average consumption rate of 213 kg (milled) per person per year. The Mission’s level of consumption on average represents about 1 640 kcal. The remaining energy and other nutrients are assumed to be derived from the limited quantities of available fish, poultry, meat, sweet potatoes, vegetables, fruits and wild foods. 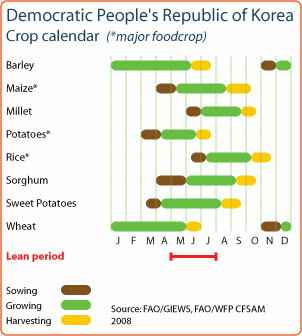 Given that soybean is the principal source of protein in DPRK, this crop has been added to the food balance sheet beginning in the CFSAM report of 2010. On average the calorie content of soybean is about 20 percent higher than that of cereals5 hence the production is increased by 20 percent to express it in cereal equivalent. Normal year seed requirement of 243 000 tonnes, based on the seed rates used in DPRK and the intended area to be sown in 2011/12, as shown in Table 7. 1/ Total includes seed for sloping lands and household gardens about 15 000 t.
Post-harvest losses of 15 percent for rice, maize and potatoes, 10 percent for wheat, barley and other cereals and 5 percent for soybeans are assumed. Lower losses for winter/spring grains are used because the normal shorter duration of storage. The level of post-harvest crop loss in DPRK has been a contentious issue in recent years, with estimates ranging from 3 percent to more than 30 percent. Unfortunately, no systematic investigation has been undertaken to clarify the issue. The Mission once again recommends that a study be undertaken to quantify losses at each vulnerable stage. The MoA has reduced animal feed requirement of cereals at 75 000 tonnes, down from 120 000 tonnes last year and even higher before. The stated policy in the country has been to emphasize small grass eating animals at the expense of large and other grain eating animals. Although this was not evident judging from the preliminary livestock numbers for 2011 as compared to 2010, this trend is evident over several years. Given this trend, for next year the Mission decided to use grain requirement of 75 000 tonnes in the balance sheet. Although reportedly there has been some investment in milling machinery, until clear evidence on the ground is collected, similar to the previous CFSAM reports, a paddy-to-rice milling ratio of 65 percent is used. No other grains are converted to milled form as the food and other requirements are expressed in the whole grain form. It is difficult to get a real figure of the stocks in the country. By and large most of the apparent stocks are exhausted by September as new harvest of maize and potatoes is distributed through the PDCs beginning in October. Given that last year’s harvest was relatively poor which resulted in very low ending stocks in 2010/11, some stock build-up at the end of the 2011/12 marketing year, equivalent to the two week national food requirements, is assumed. According to the information provided by the Ministry of Food Administration and Procurement, recognizing the projected food deficit, the Government plans to make commercial imports of 325 000 tonnes of cereals, including rice, maize and wheat, during the 2011/12 marketing year. The exact composition is not determined. Hence these imports are shown under total cereals column and not by commodity in the food balance sheet. This target compares favourably with the estimated commercial/concessional imports of 300 000 tonnes during 2010/11. The total cereal import requirement in 2011/12 is estimated at 739 000 tonnes. As indicated by various CFSAM reports in the past, since mid-1990s the cereal equivalent import requirement (i.e. the national food deficit), has hovered around 1 million tonnes, reaching over 2 million tonnes in 2000/01, the year of the worst harvest. Last year’s CFSAM estimated the cereal import requirements at 867 000 tonnes which was later revised upwards to 1.09 million tonnes due to losses of the early crops. The food gap has narrowed this year, but it still remains at a significantly high level. With a total cereal import requirement of 739 000 tonnes and planned commercial imports of 325 000, the uncovered deficit is 414 000 tonnes, equivalent to 2 months of PDS rations for the entire nation. Given the low probability of receiving increased international or bilateral food assistance, the quantity of commercial imports planned for this marketing year will need to be increased substantially to reduce the food gap. This section of the report will describe the current food security and nutrition situation in DPRK in light of and in comparison with the findings from the March 2011 RFSA along with the prospects for 2012. Information and data presented emanate from discussions with key Government officials at the national, provincial, and county levels; interviews conducted with households; and discussions held with the international community in Pyongyang. The section also relies heavily on secondary data from recent food security and nutrition assessments as well as previous CFSAMs and national data sets. The four mission teams visited agricultural cooperatives, public distribution centres, county warehouses, nurseries and hospitals. 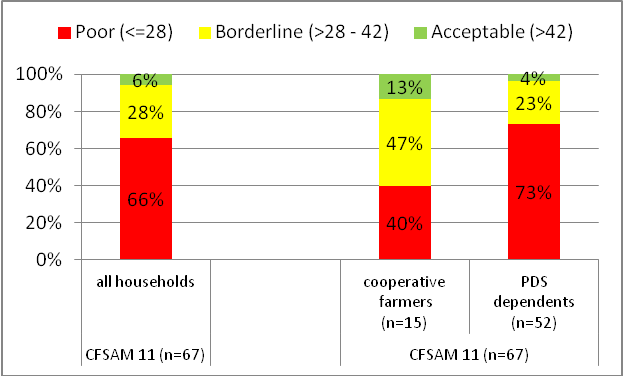 With respect to household interviews, 67 households were interviewed—of which 15 were cooperative farming households and 52 were PDS-dependent households. Around 55 percent of all interviewed households were non-WFP beneficiaries. Due to time constraints typical of a CFSAM, the selection of households for interview was not based upon a statistically random sample. While the results can be considered as indicative of conditions found in households within DPRK, they are not statistically representative of the entire population. According to official sources, households interviewed, and mission observations, DPRK maintains a centrally-planned food distribution system under which allocation of cereals for most of the population is determined by the National Peoples’ Committee (NPC). The major consumer groups are cooperative farmers, Public Administration, Defence and Social Security workers; and the Public Distribution System (PDS) dependants. Following the main harvest, cooperative farmers receive an annual allocation of 219 kg per person per year or 600 grams per person per day. The farmer allocation depends on the age distribution of members found within his/her household and the work norms including number of hours/days worked. The Ministry of Food Administration informed the mission that 1 577 821 tonnes has been allocated to cooperative farmers from the national food supply for the coming marketing year. The Ministry of Food Administration informed the mission that 179 947 tonnes has been allocated to this major industry group from the national food supply for the coming marketing year. Government authorities also informed the mission that this major industry group includes the military. After these allocations, the balance of cereals and soybeans is reserved for other worker households and institutions through the PDS. Working and retired population in this group receives a cash income and are allowed to purchase cereals from a Public Distribution Centre (PDC) at subsidized prices, according to the ration level established by central authorities. Many Cooperative Farms operate a PDC providing rations to farm residents considered PDS-dependants, such as clinic and nursery workers, and on-farm technical staff. Each year, following the harvest, the Ministry of Food Administration prepares a ration plan, based upon government estimates of the cereals remaining for distribution to the PDS. The Ministry informed the mission that they estimate 2 291 004 tonnes cereals will be available for PDS dependents during the coming marketing year (2011/12), allowing them to distribute rations averaging 380 grams per person per day. In times of food scarcity, the ration can be considerably less than planned. The average PDS ration between May and September 2011 was at or below 200 grams/person/day, reaching 150 grams/person/day in June 2011. This drastic reduction in PDS rations was last experienced in 2008, when it was maintained for four months, June through September. The ration remained constant at 200 grams/person/day from July through September 2011 supplied, at least in part, by the harvest of early crop potatoes, wheat, and barley. A comparison of PDS rations on a monthly basis is depicted in Figure 5. The mission had unprecedented access to markets in the country, as did the RFSA earlier this year. All teams spent time surveying different markets and their attributes. In DPRK there are three main types of formal markets where people can buy food and non-food commodities: State Shops; Daily Markets; and Farmers’ Markets. State shops are open seven days a week to provide families with such essentials like the soybean sauce, soybean paste, and cooking oil at subsidized prices. Each household is assigned to a state shop and, for certain commodities, is entitled to a monthly quota that is set by the Ministry of Commerce. Essential food items include: soybean sauce (50 grams/person/day), soybean paste (30 grams/person/day), and cooking oil (20 grams/person/day). The mission also observed non-food commodities in State shops, including: school supplies, clothes, shoes, blankets, kitchen utensils, ceramics, cigarettes, beer, rice wine, children’s toys, and single-band radios. Whether households can purchase their full allocation primarily depends on availability. For example, many households reported that soybean oil has not been available since early February. Others households reported that meat is only available on special occasions like the New Year or the National Holidays. The Peoples Neighbourhood Unit (PNU) announces when new supplies arrive and informs a household’s entitlement. Payment is collected from households and tokens issued specifying the items and quantities that can be collected from the state shops. The variety and quantity of available food and non-food commodities varies from county to county. Some shops were observed to have other food items for sale, such as wild vegetables, biscuits and salt. The mission observed that State shops in rural areas have fewer commodities available than those in large urban centres. Daily markets exist in urban centres and provincial capitals. The mission was informed that the sale of cereals is officially prohibited and members did not observe any cereals for sale in the daily markets visited. Food items observed were potato, vegetables, pulses, wild vegetables, seafood, fish, eggs, and meat, including rabbit, chicken, and duck. Non-food items included farming tools, baskets, brooms, school supplies, clothing, and other household items. Commodities were available in small quantities speaking to the size of the market. The prices in these daily markets were competitive, with prices of vegetables varying according to size/quality. The prices quoted for many food items were far lower than quotes for similar items in the Tongil market of Pyongyang, in some cases as low as one-tenth the cost. The Farmers’ Markets occur every ten days or three times each month. Sellers bring their food and non-food goods to the market where they pay a fee of KPW10 to secure a two-metre stall for the day. The mission was informed that the sale of cereals is officially prohibited and members did not observe any cereals for sale in the farmers’ markets visited. The main food items observed in these markets were potatoes, vegetables, fruits, eggs, meat, fish, lentils and spices. Non-food items included basic farming equipment, woven baskets, school supplies, clothes, knitted socks and gloves. The mission observed that sellers brought commodities in small quantities, despite the fact that these markets occur only three times a month. When the PDS broke down during the famine years of the 1990s, informal market mechanisms developed. Although restricted after 2005, they exist and continue to provide an important source of food, particularly when the PDS is not able to supply cereal in sufficient quantity. The mission believes that these informal market mechanisms played a critical role in helping households to source cereal during this past lean season. As sale of cereals is officially prohibited, direct questions about this type of market activity usually received an indirect response. Households interviewed were quite comfortable describing exchanges of cereals as gifts or barter. Households cultivating gardens have better access to food because of own production and because of opportunities to earn extra cash income. The gardens supply maize, potatoes and vegetables. Vegetables grown include cabbage, spinach, onion, garlic, beans and tomatoes. Production from kitchen gardens can be sold or bartered in the markets, providing additional cash income. Most cooperative farming households and many PDS-dependent households in urban areas maintain a household/kitchen garden. However, many residents of apartment blocks reported they did not have access to any land to cultivate. The size of household/kitchen gardens range from 15-30 pyongs (60-100 square metres), with households belonging to farming cooperatives having larger kitchen gardens than their urban PDS counterparts. Livestock rearing provides access to meat for household consumption and as an asset for gifts or barter exchange for cereals or other items. Most cooperative farmer households reported owning small livestock, usually rabbits, pigs, and/or poultry. Fewer urban PDS dependents reported raising livestock due to limited space in apartment buildings. However, some households without household / kitchen gardens reported raising small animals, especially rabbits. Many households reported to have slaughtered animals for own consumption, gifts, or barter exchange. As with cereals, the mission believes that the terms gifts and barter/exchange are a euphemism for informal market activity. While there exist institutions and mechanisms through which food can be accessed (i.e., farmers’ markets, state-owned shops, kitchen gardens), the quantity and diversity of food is limited. The primary source remains the State-run PDS. However, in 2011, a combination of factors resulted in the majority of the population suffering prolonged food deprivation. The WFP-FAO-UNICEF RFSA alerted the international community and the Government that the combination of lower than expected yields from the 2010 main crop, the severe winter, and the low level of imports could have serious implications on the food security and nutrition status of the population during the 2011 lean season. Emergency appeals to the international community were largely unsuccessful and the Government of DPRK had to institute a series of measures intended to stretch their existing food stocks until such time as the 2011 early crop and main harvest were available for public distribution. As noted above, the dramatic reduction of the PDS ration was one of the first actions taken to respond to the overall food shortage. In addition to the PDS ration reduction, the Government continued to import food. As part of this overall process, the Government also allowed Provinces to contract for commercial import of cereals as well as permitting joint-venture enterprises and factories to import cereals to feed their workers. Last, but not least, large-scale organized expeditions to collect wild foods were launched by Provincial officials. Given that for long stretches of time, the PDS only provided around one-third of the daily energy requirements, households accessed food from other sources. Notably, relatives living on cooperative farms gave up portions of their own food allocations to assist PDS dependents in urban areas. During the CFSAM interviews, nine of out ten PDS-dependent households reported to have received support in the last twelve months, and three out of four farmer households declared to have provided such support to their PDS relatives. Support provided from relatives is more common following the early crop (May-July) and the main harvest (October-December). More than half of the PDS-dependents interviewed reported receiving food support during the lean season months of June-July (Figure 6). However, as the population of PDS dependents is twice that of cooperative farms, rural households were placing their own food security at risk. Household gardens and foraging for wild foods were also frequently reported by interviewed households. However, the quantities could not adequately cover the gap created by the low PDS ration. In turn, coping strategies that were only occasionally used in the past have become common practice. Around two-thirds of all households reported skipping one or more meals in the week prior to their interview and over half reported to have reduced the portions size of meals that they had eaten. And almost all households indicated that water was added to their food to increase its volume. These particular coping mechanisms were reported in the RFSA and in previous CFSAM reports, but they appear to have been more widespread during CFSAM 2011. The consumption of wild foods (edible grasses, acorns, pine nuts, wild berries, mushrooms, bell flower roots, and along the coastal areas, sea weeds etc.) remains a common practice in the diet of Korean people. Its seasonality is linked with availability of items, and those plants provide an important intake supplement to the people’s diet, particularly in early spring, when people stocks for rations from the main harvest are depleted and early crops are still in the fields (Figure 7). Households and officials reported to mission members that collection and consumption of wild foods is a strategy used frequently to cope with limited PDS rations and limited availability of food from other sources. Both households and county officials reported good availability of wild foods during the past lean season. The limiting factor to access such items was reported to be a household’s capacity and time to go and collect as much as they could or needed. While this would mean a relative good availability of supplementary food items for people with good access to those resources, it would also imply that urban households living far from mountains/wild areas and those with limited capacity to go like the elderly might not be able to supplement their diet with those alternative items increasing their dependency on subsidised foods available from PDS or state shops, which are limited in quantities, or from formal or informal markets where purchasing power becomes a key factor for accessibility. Interviewed households reported a diet mainly based on carbohydrate, with low consumption of protein, fat and micronutrient rich items. 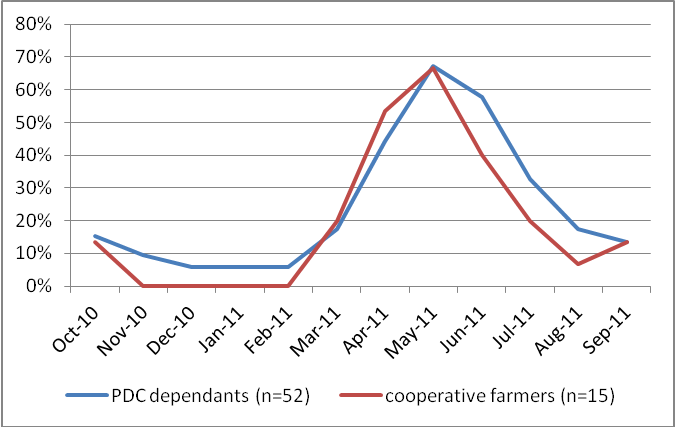 Among the interviewed households, PDS dependants had poorer food consumption patterns than coop-farm households (Figure 8). These observations are consistent with previous assessments. The better availability of vegetables (including wild plants) from kitchen gardens and other lands during late summer has improved the people’s food intake. A food consumption score was used to evaluate household food intake. Households were asked to list the foods they consumed in the seven days prior to the interview. Food items were classified into food groups and points are tallied for each food group consumed in a given day. Points are assigned as follows: Cereals or tubers = 2; Pulses = 3; Vegetables = 1; Fruit = 1; Meat or fish = 4; Dairy products = 4; Oils = 0.5; and Sugar = 0.5. Sixty-six percent of households were found to have a “poor” food consumption score (less than or equal to 28 points), while the remaining twenty-eight percent were considered “borderline” (greater than 28 and less than or equal to 42). Only about six percent of households interviewed had an “acceptable” food consumption score (greater than 42 points). Among all interviewed households, the diet in the week before the assessment generally consisted of only three food groups, including: daily consumption of cereals or tubers; daily consumption of vegetables (including wild plants); and very frequent consumption (average 6 days per week) of condiments like bean paste or soy sauce. Households with “poor” food consumption were able to add only oil to their diet for an average of 2 days per week. Those with “borderline” food consumption included: edible oil (5 days per week), pulses (1 day per week) or animal-protein (eggs, meat or fish, 2 days per week), fruit (1 day per week), and/or sugar or sweets (1 day per week). The very few households found with “acceptable” food consumption were able to consume animal-protein rich food more frequently (avg. 5 days per week), pulses (2 day per week) sugar or sweets (1 days per week), and oil almost every day (5 days per week). Diet patterns were found to be better among households with direct access to kitchen gardens and animals. Households interviewed after the national holiday on 10 October reported having consumed a more diverse diet on that day alone. Food security and nutritional status are inter-linked and the situation in DPRK is no exception. Although there has been steady improvement over the past few years, indicators of maternal and child undernutrition remain high and are of particular concern after the prolonged food deprivation of the past lean season. The Central Bureau of Statistics (CBS) carried out a Multiple Indicator Cluster Survey (MICS) in October 2009 with technical and financial support from UNICEF and logistics support from WFP. It provides the most current statistics on the nutritional status of women and children. The national prevalence rates for indicators of undernutrition in children were 32 percent stunting (low height-for-age); 18 percent underweight (low weight-for-age); and 5 percent wasting (low weight-for-height). The high national prevalence rate for stunting is a result of inadequate nutrition over a prolonged period and reflects the consequences of limited energy intake, limited protein and fat content, limited dietary diversity, and recurrent or chronic diseases. MICS results indicated large regional disparities in chronic undernutrition between the provinces, ranging from 22 to 45 percent. The highest prevalence rates for stunting were found in the five northern and eastern provinces of Ryanggang (45 percent), Chagang (41 percent), South Hamgyong (39 percent) North Hamgyong (38 percent), and Kangwon (34 percent). Addressing chronic undernutrition through nutritional interventions in these provinces needs to be a high priority. The prevalence of wasting, or acute undernutrition, is one of the short-term consequences of food shortages among young children and is therefore often used as an indicator in emergency situations. The prevalence of wasting often varies seasonally, reflecting the changes in food availability and intake, as well as health status. Data from the MICS 2009 survey indicates that the national prevalence of acute undernutrition was only five percent. As with chronic undernutrition, the highest prevalence rates for wasting were found in the five northern and eastern provinces of Ryanggang (7.9 percent), South Hamgyong (7.3 percent), North Hamgyong (7.2 percent), Chagang (6.9 percent), and Kangwon (5.7 percent. Data from the MICS indicated that one out of four women of reproductive age (25.6 percent) are undernourished, as measured by mid-upper arm circumference below 22.5 cm. Undernutrition during pregnancy has an impact on maternal mortality and morbidity, and also increases the likelihood of giving birth to low birth weight babies (less than 2.5 kg). Children born with low birth weight, in turn, are at increased risk of mortality and of becoming stunted. Birth weight therefore is an indicator both of the mother’s health and nutritional status, as well as the child’s survival, growth, health and development. In 2009, the percentage of newborns born with birth weight of less than 2.5 kg was found to be low, only 5.7 percent. Among micronutrient deficiencies, vitamin A and zinc have been found to be the greatest contributors to disease burden because of their effects on child health 6. In DPRK the supplementation of high dose vitamin A to children is universal, covering 98 percent of children according to the 2009 MICS. The coverage of vitamin A supplementation to mothers post-partum is equally high, 97.5 percent. Zinc tablets for treatment of acute diarrhea have been provided by UNICEF, but coverage data is not available7. Iron deficiency is a risk factor for maternal mortality, and anaemia in pregnancy increases the risk of preterm and low birth weight and subsequent risk of anaemia in the infants. The prevalence of anaemia among women was last reported in 2004, with about 35 percent of in women of reproductive age anaemic (Hb <12.0g/dl). In 2009, almost all women (98 per cent) of reproductive age who had delivered a live birth two years prior to the MICS survey reported having taken micronutrient supplement during pregnancy. However, only 44 per cent had taken the full course for the required period of six months. Iodine deficiency, particularly in the first half of pregnancy, hampers brain and nervous system development and can result in reduced cognitive development and population IQ. Mental impairment reduces intellectual capacity throughout the lifecycle, affecting school and work performance. The MICS survey found that only a quarter (24.5 percent) of households consume adequately iodized salt in DPRK. Urban households are more likely to use iodized salt than rural households (29 percent versus 18 percent). The findings of the CFSAM related to nutrition are primarily based on focus group discussions with key informants, including the county level directors of public health, and medical staff from paediatric and maternity wards at county hospitals. At county level, the directors of Public Health in most counties indicated an increase in undernutrition among children during the lean season. A review of hospital records from counties visited by the mission confirmed a drastic rise in the number of malnourished children admitted to paediatric wards, starting from April 2011 (Figure 9) and represents a 50 to 100 percent increase compared to last year. Records also indicate a higher prevalence of infants born with low birth weight during this past lean season. As birth weight is associated with the mother’s nutritional status during pregnancy, it is clear that inadequate food intake contributed to the prevalence of maternal undernutrition during the lean season. Medical staff at county hospitals reported increases in the number of cases of anaemia among pregnant women during the lean season, as well as in the general population. Common symptoms among those who sought medical care were dizziness, weakness, fatigue, and headaches. According to medical staff, these symptoms were related by reduced food intake. The mission team also saw cases of oedema—an extreme manifestation of malnutrition—in the Northern and Northeast Provinces. In a few county hospital interviews, skin conditions in children were mentioned, which may be a sign of micronutrient deficiencies such as pellagra (niacin deficiency). 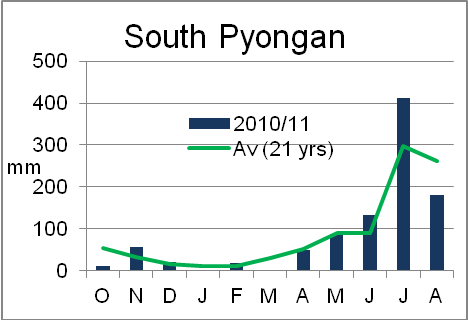 These cases were recorded in North and South Hwanghae, where the PDS ration was primarily based on maize during the months of September and October 2011. In State Shops visited by the mission, the salt available for sale was not iodized, which is in line with the findings of the MICS that the majority of households do not have access to adequately iodized salt. Although households now have increased access to carbohydrates following the harvest of main crops, sources of protein and fat will continue to be very limited. There is a high risk of micronutrient deficiencies during the coming winter season, when access to fresh fruits and vegetables will be limited. Infants who were born with low birth weight during the past lean season will need correct breastfeeding and complementary feeding practices, in order to sustain sufficient weight gain and growth in their first two years of life. Similarly, children who suffered acute undernutrition during this past lean season will need access to fortified supplementary food in order to prevent relapse into mild, moderate, or severe stages of acute undernutrition in the months following their recovery. Nutrition screening of children under 5 using mid upper arm circumference (MUAC) in the northern and eastern provinces was recently conducted by UNICEF and the EUPS Unit 2. The results will give an indication of the prevalence of acute undernutrition among children in the target counties. In addition, WFP is in negotiations with the Government to conduct a similar MUAC assessment in all 107 counties where it is delivering food assistance. During the marketing year, 2010/2011, international food assistance totalled 28 750 tonnes, of which approximately ninety percent (25 685 tonnes) was provided by WFP. From 1 July 2010 to 31 March 2011, WFP distributed 11 198 tonnes of food assistance in 65 counties/districts of seven provinces, mostly fortified food products through its Protracted Relief and Recovery Operation (PRRO 200114), which emphasized nutritional support for women and children. Beneficiaries included: pregnant and lactating women; children and accompanying mothers in paediatric hospitals/wards; orphaned children; and children attending nurseries, kindergartens and primary schools. In early 2011, DPRK requested emergency food assistance following a series of shocks, including: extremely heavy rainfall at end of the growing season in 2010; a harsh winter with prolonged cold; and significant milling losses due to high moisture content and immature grains. WFP, FAO, and UNICEF conducted an interagency Rapid Food Security Assessment (RFSA) which revised the estimated total cereal import requirement to 1 086 000 tonnes, with an uncovered deficit of 886 000 tonnes. In response to the assessed need, WFP commenced a one year Emergency Operation (EMOP 200266) from 1 April 2011 through 31 March 2012 that replaced the PRRO, but included provision of similar fortified food products. Under the EMOP, WFP distributed 14 487 tonnes of food assistance in 107 counties/districts of eight provinces, mostly fortified food products. WFP has received only 31 percent of the resources needed for the EMOP, to date. As a result of funding constraints, many vulnerable groups do not receive food assistance from WFP in the quantities planned. Insufficient funding for its nutrition, health and water and sanitation activities has limited UNICEF’s capacity to reach vulnerable populations with therapeutic feeding products. 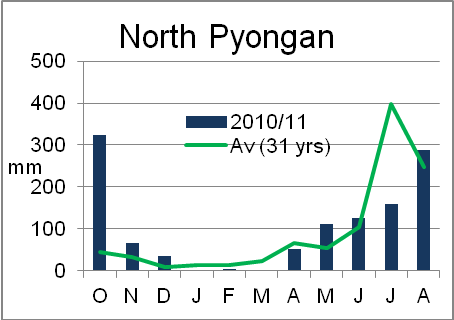 In 2011, DPRK government approached a number of resident and non-resident international NGOs for assistance to respond to the food shortage derived from the harsh winter as well as to production losses caused by heavy rains and localized floods that hit in July/August 2011, and a number of INGOs developed food assistance projects in response. A total of 497 tonnes of food assistance were donated through resident INGOs (EUPS Units) between November 2010 and September 2011, including: 344 tonnes of cereals; 128 tonnes of soybeans; and 25 tonnes of vegetable oil. The Government informed the mission that a total of 2 568 tonnes had been received by non-resident organizations in 2011, in response to the summer heavy rains and floods. The northern and eastern provinces of Ryanggang, Chagang, South Hamgyong, North Hamgyong, and Kangwon have prevalence rates for underweight children at or above the WHO threshold of twenty percent. They also have stunting and wasting rates above the national average and the greatest number of food deficit counties. Based upon these established measures of food insecurity, these five (5) provinces should be considered first priority for food assistance, as they are the most vulnerable to food and nutrition insecurity. The provinces of North Pyongan, South Pyongan, North Hwanghae and South Hwanghae have underweight prevalence rates below twenty percent, stunting and wasting rates below the national average, and fewer food deficit counties. These provinces should be considered second priority for food assistance resources. Pyongyang municipality and Nampo City are the most food secure as they have low prevalence rates of undernutrition and benefit from food transfers from surplus provinces. Certain household members are more vulnerable to food insecurity, including young children, pregnant and lactating women (PLW), and the elderly living alone. There are an estimated 3 million vulnerable people, of which 2.03 million reside in the five most food insecure northern and eastern provinces. An additional 970 000 people reside in the four southern and western provinces, where undernutrition rates are lower and fewer counties are food deficit. Included in the 3 million are approximately 25 000 other highly vulnerable people in need of food assistance, including: 13 000 patients in paediatric wards and 12 000 children living in orphanages. Table 9 presents the estimated number of people in need of food assistance requirements for 2011/2012, based on the DPRK 2008 population census. 1/ Excludes children of less than six months of age. 2/ Approximately 10 percent of the elderly population. 80 000 tonnes of fortified blended food to 2.03 million vulnerable people in all counties of the five most food insecure provinces, with the highest rates of undernutrition, including: Ryanggang; North Hamgyong; South Hamgyong; Chagang; and Kangwon. 40 000 tonnes of fortified blended food to 970 000 vulnerable people in the food deficit counties of North and South Pyongan, and North and South Hwanghae provinces. 60 grams/person/day for Children attending Primary School. Different response options should be considered in order to reach those identified as vulnerable to food and nutrition insecurity. The section below describes some response options. Pregnant and Lactating Women (PLW) – To support both maternal and child nutrition PLW should be provided with macro- and micro-nutrient balanced blended foods throughout the full pregnancy and lactating period (the first 1000 days). Blended food can be distributed to PLW through their PDC or their cooperative farm’s PDC. However, alternative methods of distribution should be explored that permit targeting of assistance to those PLW who are vulnerable to food and nutrition insecurity. Children under five years of age - Due to their special nutritional requirements, children from 6 months to 5 years of age should be provided with macro and micro-nutrient balanced protein-rich blended foods. Nurseries, kindergartens, and those being cared for at home – Given the high enrolment rate in DPRK as reported by Census 2008 and MICS 2009, distribution of food through educational institutions is an effective method to reach children in the selected age categories. However, the mission did interview a larger than expected number of households with children being cared for at home by a relative, usually a grandparent. Children cared for at home by a parent or relative should also be eligible to receive blended food. Children attending primary school – Provision of fortified biscuits to primary school children is an effective method of enhancing the protein and micro-nutrient content of their diet. Orphanages – Both cereals and blended food should be provided to children residing in orphanages (baby homes, child centres and boarding schools). Paediatric wards/hospitals – Assistance to paediatric wards/hospitals is needed to support children who are ill. These children are in need of extra nutrients to facilitate rapid and full recovery. Assistance is also needed for mothers/caretakers who stay in wards/hospitals to accompany the children. Elderly - During the assessment, elderly were one of the groups identified as in need of assistance. Blended food can be distributed to elderly dependants their PDC or their cooperative farm’s PDC. However, alternative methods of distribution should be explored that permit targeting of assistance to those elderly who are vulnerable to food and nutrition insecurity. Large families - During the assessment, large families were one of the groups identified as in need of assistance. Families with high dependency ratio, i.e. with high number of children and/or elderly compared to working/income earner people, face difficulties in sustaining their food security. Large families can be assisted through providing food to their children. Distribution of blended food products through the State shops - There is a need to identify methods of distributing blended food products other than through the PDC, particularly those that facilitate targeting of assistance to households and individuals that are most vulnerable to food and nutrition insecurity. State shops are the recognized mechanism for distributing processed food products, including biscuits and noodles. The mission recommends exploring the feasibility of distributing blended food products through State shops to Pregnant and Lactating Women (PLW) and the elderly, possibly through use of vouchers. Support production and distribution of soybean paste and oil– There is a need to address the lack of protein and edible oil in the diet. Soybean products are the principle source of protein for most of the population. State shops are the established mechanism for distributing soybean products, including bean-curd, soybean paste, and edible oil. The mission recommends support for the production and regular distribution of soybean products, possibly through use of vouchers. The following three recommendations are in addition to the five recommendations in the 2010 CFSAM report (namely, the improved potato storage and maize drying facilities, development of protein rich food commodities and support to the household gardens), each of which remains valid this year. potato seed is short in all areas, and for the spring crop as well as the main crop, but the shortage is more severe in the south (where the spring crop is more important than the main crop in the north); the shortage is likely to get worse due to losses of potato seed in storage due to freezing and rotting; already farm managers are reporting that the potato seed that they do have comprises very small tubers, and even these will have to be individually divided to make them go further; these are normally sown around the third week of March in the south. Second, the importation and delivery of plastic sheets to ensure that under normal conditions (but particularly if there is a prolonged winter and late spring, as there was in 2011 and 2010) paddy and maize seedbeds are properly protected. Additionally, the importation and delivery of crop protection chemicals, especially insecticide to cope with the insect outbreaks reported in this year’s and last year’s CFSAM reports. Also herbicide which limited Conservation Agriculture (CA) operations on several farms this year. Third, CA and mechanisation. MoA has a positive general policy on the future of CA as the basis of the recovery of agriculture, but this should go hand-in-hand with a mechanisation policy and strategy that are missing. CA should be at the core of any such policy and strategy, but it should be wide enough for all aspects of mechanisation for agriculture. It is recommended that MoA initiates a formal dialogue that could eventually lead to such a policy and strategy. It should principally involve MoA, FAO, farm managers, and representatives of County Farm Management Committees (CFMCs). MoA may also wish to include aid agencies such as the EU and its Project Support Units in DPRK, as well as IFAD, and SDC. Implement preventive measures to avoid a recurrent drastic increase of acute malnutrition and diarrhoea in children during the 2012 lean season. Undernourished children are more likely to suffer from diarrhoea and its consequences, and ensuring adequate food supply of nutritious foods to children prior and during the lean season can serve a dual purpose of preventing both undernutrition and related diseases. Other essential interventions include promoting appropriate infant and young child feeding practices, and improving hygiene and sanitation. Implement preventive measures to protect the health and nutritional status of pregnant and lactating women, who are at increased risk of acute undernutrition and micronutrient deficiencies. Providing additional nutrients to women during pregnancy will also prevent low birth weight and stunting of infants. The lactating women require additional nutrients as well as support to continue breastfeeding. Interventions to be considered are protein rich fortified blended foods provided to the most vulnerable groups as a protective ration, in particular during the lean season. Pre-position sufficient supplies of therapeutic and supplementary foods in county and provincial hospitals to ensure appropriate treatment of acute undernutrition of children. Micronutrients, including vitamin A, are also essential to improve the immunity and reduce the risk of mortality for children who are suffering from acute malnutrition. Promote increased intake of protein and fat through increased capacity for food production and processing. Interventions could include supporting the cultivation and processing of soybeans for increased production of soymilk and oil, and breeding of goats for production of goat’s milk or yoghurt. These commodities are currently being supplied to institutions and hospitals, but in insufficient quantities. Implement the iodization of salt nationwide to address the prevalence of iodine deficiency. This report has been prepared by Kisan Gunjal and Tom Morrison (FAO) and Michael Sheinkman, Samir Wanmali, Cheng Fang, Marina Kalisky, and Andrea Berardo (WFP); under the responsibility of the FAO and WFP Secretariats with information from official and other sources. The authors wish to acknowledge valuable contributions from Belay Gaga (FAO) and Dageng Liu and Ruangdech Poungprom (WFP). Since conditions may change rapidly, please contact the undersigned for further information if required. 1. Based on EIU, Bank of Korea, and Korea Development Institute, Seoul publications. 2. Source: Peterson Institute for International Economics, Policy Brief, Number PB10-1 (page 6), January 2010. 3. The management of orchards, which used to be under the direct control of the cooperative farms, is gradually being taken over by the National Fruit Agency in order to increase efficiency through economies of scale and enhanced access to new technologies. 5. Calorie content of soybeans varies from 335 kcal to 470 kcal per 100 g depending on the oil content of the beans. 6. The Lancet Series on Maternal and Child Undernutrition, Executive Summary. 2008.